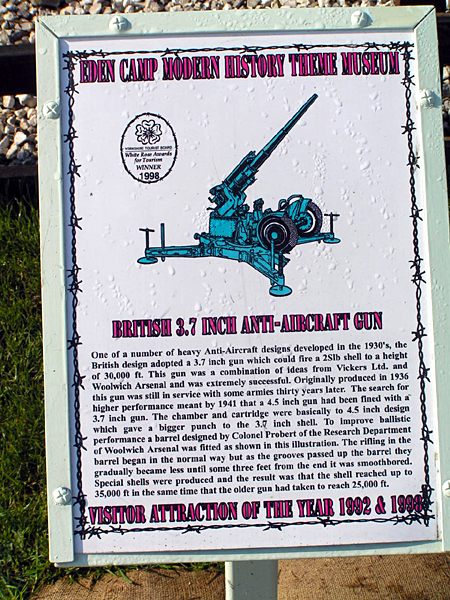 These were usually Bofors guns, which fired small shells, or larger 3.7 inch guns. Rarely were aircraft hit, but there was a danger to people on the ground from their own bombardment, as pieces of shrapnel fell back to earth. This was especially true for people out firewatching or patrolling. Schoolboys loved to collect the bits, however. One problem was timing the fuses so that the shells exploded at the right height. Eventually 'predictors' were developed, which could be used to calculate what timing to set on the fuse, but most people have told us that anti-aircraft fire was more of a morale booster than an effective deterrent. Batteries were set up in local parks, like Fox Hollies Park, and on the Green as well, surrounded by sandbags. So what was so good about the war? Well for us kids it was very exciting! We used to watch our fighter planes dogfighting with the German aircraft with the vapour trails all over the sky. One morning going to school (Hartfield Crescent) we walked through the gully from Shirley Road to Fox Hollies Road and there in our playing field was a Messerschmitt fighter plane with its nose buried in the field. What a prize! We were over it like a rash grabbing every bit of loose stuff there was. I remember very clearly one lad walking off with one of the plane's guns, complete with a belt of ammunition. Looking back it seems quite funny. I think we were about eleven or twelve years old. I believe the pilot got out safe and well and knocked on a door in Fox Hollies Road and surrendered. I have no idea if he was shot down by anti-aircraft guns or British fighters. This is the sort of thing that gave us what today they call street cred. We collected bits and pieces from bombs shells [to] ammunition in fact anything you could get our hands on. Most lads had a sandbag where they kept their prized possessions and were very quick to show them off. Fins from fire bombs were much sought after and the larger pieces of shrapnel were to be admired. A story of my own: I was walking down Gospel Farm Road when I came across a bomb lying on the edge of the pavement. It was intact except the fin was a bit dented. I promptly picked it up and took it home. I walked into the house and put it on the kitchen table. It is amazing how fast a house can empty. I had no fear nor did I see any danger but the adults in the house did not think my way. The police were called. Somebody put the bomb in the back garden and covered it with sand. It was a firebomb; we called them incendiary bombs in those days. Two soldiers came and took it apart then gave it back to me with a not overdue warning about the dangers of picking things up. I still had that bomb in the shed when I joined the army in 1950. My mother disposed of it and my sandbag full of shrapnel before I returned home. We used to go over to the racetrack on York Road, because the Americans had an ack-ack site there, and were billeted there. We kids went over there, and they gave us gum. These huge balloons were designed to stop enemy bombers flying low and being able to bomb accurately. They were called barrage balloons, and were floated up into the sky on strong cables, which could bring down any aircraft. It was possible for the people on the ground to control how high the balloon flew. Barrage balloons were put on fields, sports ground, and open spaces on housing estates. Enemy aircraft tried to shoot them down, and they also broke free sometimes and passed over people’s houses. Here are some memories of barrage balloons. I used to keep my car at number 110 (Westley Road)….she was a widow. She'd got a bit of a verandah, and she was wakened this night, with something rubbing and flapping, as she thought, oh, the door's come undone. "I can't go to sleep in this", so she groped her way downstairs - you didn't put lights on - she felt her way round, opened the back door, and groped into a great big squashy sort of substance. She found it was a barrage balloon, and they are absolutely enormous things, so she yelled for the air warden (Charlie Trumper). She yelled for him, yelled blue murder. Charlie came out, took one look at it, and fainted. They phoned up the A.R.P. people, and they came out and gathered it up. It frightened the living daylights out of us, because the cable of it came across our roofs, and it was like a train going across the roof of our house. I said: "What could it be?". Got up and groped around. Tried the bathroom, tried the lavatory...All the house was intact and we didn't know what it was. It had broken clear, see. there it was, shaped like an elephant...They used to have them on a long cable, about 10,000 feet up. We used to have a barrage balloon, at a very derelict house, Sunnydale or Sunnymead...it's now a park for the children. This balloon, as far as I can recollect, was shot down three times during the war. The cable fell across our roofs, and made a right mess of the tiles and so forth, and there were various bits, secret bits put on this balloon for explosion and what not, and most of the R.A.F. people spent most of the night chasing round trying to find where the boxes had got to. They were captive balloons - large things. they looked just like baby elephants stuck up in the sky, and they were let off to a certain height, you see, and the idea was to keep aircraft from flying low. Well, frequently they broke loose, and one did break loose, and it was just floating - we could just see it in the starlight, Bill and I. It was just floating gently down over our garden. Of course the one thought straight away in our minds was landmine, because they used to float mines down, you see, which exploded (in the air when the probe underneath made contact, ed.). And this thing was just floating about nice and steady, after a plane had gone, just in the right place at the right time. Well, we grabbed a spade each and waited for it! God knows what we were going to do! That's what you do at the time, you know! Anyway, the thing disappeared over the roof and took the roof off a house over there...the cable dangling, you see...they were terrific things, and with the wind behind them they were quite capable of ripping the roof off. It must have been about 1941. God knows what happened to it, I suppose it came to rest somewhere. There are several mentions of barrage balloons in Frank Taylor Lockwood's diary. A painting by Dame Laura Knight of women raising a barrage balloon (Imperial War Museum) Enter the phrase 'Laura Knight balloon' in the search box and click on Search.